Twilight Zone Tower of Terror is an excellent drop tower in Sunset Boulevard and one of the best attractions at Disney's Hollywood Studios. The minimum height to ride is 40 inches. 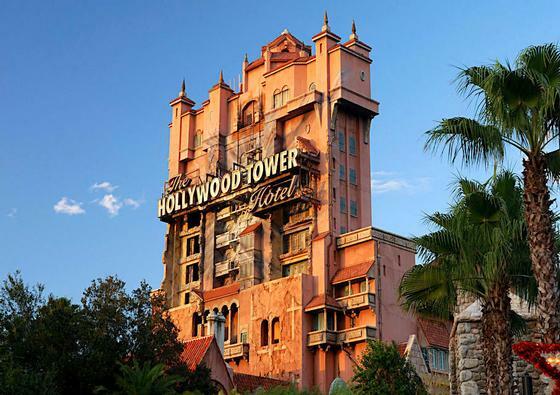 The story takes place in the Hollywood Tower Hotel, an “Old Hollywood” resort from the late 1930’s. Bellhops greet you and direct you to wait in the library. Inside the small room, the lights go out, and an old, black-and-white television turns on to welcome you into an episode of The Twilight Zone. When the bellhops return, they’re not taking you up to your room, but down into the boiler room, where you’ll board a service elevator for ride of your life. This elaborately themed drop ride offers multiple drop sequences, so you’ll probably not get the same ride twice. Note that Twilight Zone creator Rod Serling really does appear in the pre-show film, thanks to clever editing from Disney’s Imagineers, who used clips from dozens of Twilight Zone show introductions to splice together the ride’s pre-show introduction. Of all the versions of this ride - This is by far the best experience.